While at CHA, I had the pleasure to sit down with Susan Opel and Cath Edvalson, Editors of Paper Crafts magazine and chat with them about the future of the magazine. Ashley Harris: How was the transition from CK Media to New Track Media (the company who purchased Creating Keepsakes and Paper Crafts magazines from CK Media)? Susan Opel: Change isn’t always easy but I would say that what we are seeing in the future is very bright and whatever the transition brings, we’re ready for it. Cath Edvalson: I would agree. Things are looking good and we are very hopeful. We are still in a state of transition while we wait and see what is going to happen with our production schedules and what special issues will be put out. It is going to be really, really good. Ashley: Now you have the Go To Gals and I am huge fan of these ladies as you know. What will be their role in the magazine going forward? Susan: One of the things our Editor in Chief is really excited about is getting them online. On message boards, Facebook, Twitter and what not and getting people excited about the magazine. Being online ambassadors for Paper Crafts and telling what they love about it. Cath: They will have a strong presence in the magazine and they will be contributing to some of the columns and articles. The term Go To Gal was an organic phrase meaning these are the gals that we go to. Ashley: Cath, tell me about your blog, Moxie Fab World. Are you just loving it? Cath: I am really, really enjoying Moxie Fab World. It is a ton of fun to write. I love to be able to look at the product in depth and show the world how I see it. I get a lot of enjoyment out of that. What I like the most about Moxie Fab World, is reading the comments that people leave. I actually get to know people by what they say. It has turned into a connective community. Ashley: I really love the Moxie Fab Challenges. Cath: The challenges are fun to set up. I love looking for the examples to show the a current market trend. It seems like every challenge we do, it gets harder and harder to narrow down the winners. When doing the bag lady challenge, there are already so many images and there are even some direct translations. Some are shaped the same way and have the same type pattern and it is just so fun to see. The challenges are like calls, but everyone sees what everyone does not just the ones that are selected. You can do more of them as they are run every other week, whereas the magazine is only puts out 6 issues a year. You can do so much more because there is so much inspiration out there. Susan: Another thing that we’re really loving about Moxie Fab World is, the person who reads the Paper Crafts Connection blog isn’t necessarily the same person as the person reading Moxie Fab World. They have two very different followings. Cath: You are seeing something fresh and new on each blog. In order to do that we have to spin different angles for the same item. For example when they announced the Go To Gals on the Paper Crafts Connection blog they took examples of the girls work from previous magazine issues. When I announced them on Moxie Fab World, I took images from the Go to Gals’ personal blogs that they had recently posted that people might not have seen. This was truly a treat for me to sit down with these ladies and pick their brains a little. Thank you Susan and Cath so much! Be sure to check out both the Moxie Fab World blog where you will find amazing inspiration from Cath, and the Paper Crafts Connection blog where you will meet the Go To Gals and their endless talent. What are you hoping to see from Paper Crafts in the future? Leave your comment tomorrow by noon EST and be entered in a drawing for the latest issue! I love this magazine...I've been thinking about subscribing to it lately. I always find lots of inspiration.....awesome work girls! I think Paper Crafts should keep doing what they're doing. Awesome inspiration - and I love both the PC blog and the Moxie Fab blog. It's great that they're reaching out to the online world too to keep us all connected. I just subscribed, so I’m looking forward to everything! I think I would like to see some paper wreaths or other "wall" related stuff....just something I've been thinking about. Thanks for all the inspiration! I am alsways amazed byt the ideas-so many that I would never think of! I can't even think to suggest what I would like to see-but look forward to its release! Thanks for the chance! Totally love this magazine...their ideas are so fabulous, but not over the top! I enjoy Papercrafts Magazine and like the mix of cards and other paper crafted projects! I enjoy reading Papercrafts and like the mix of handmade cards and other papercrafted projects! I enjoy checking out the cards and special holiday crafting ideas that they have. I enjoy Papercrafts Magazine, although not currently a subscriber. I would love to see more Anniversary cards. I love Paper Crafts always fresh look. I'd like to continue seeing page after page filled with amazing artwork and some great tutorials! 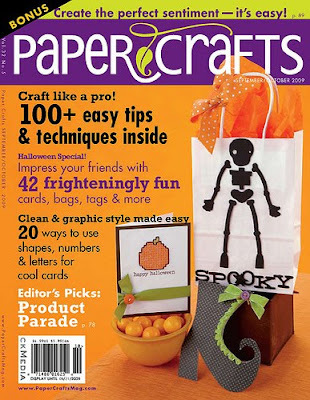 Paper Crafts Magazine is wonderful - I'm always pleased with everything they have to offer. I'm a big fan of the blogs as well. I'd love to SEE a PaperCrafts magazine. I've always stuck to scrapbooking only mags, but I'm sure I'd find inspiration in a Paper Crafts issue. I look to this publication for tangible examples of what is happening in the card world now and I look to Moxie Fab World for new trends that are up and coming. I appreciate both although and get a kick out of Moxie Fab world although I don't live and die by the next latest trend. I think Paper Crafts is a great magazine, because it covers everything paper. It is one of the few magazines in this genre left. Keep up the good work. I loved the special issue that had sets of cards to give as gifts. I'd love to see more of those. One of the few magazines that I actually seek out these day!! !